I thought this summer would end without me having the chance to experience the sea. It only takes a big company like Fleishman Hillard to actually make me grab my bag and two-piece swimwear. Zest Air flew us to Kota Kinabalu for a weekend familiarization trip, and I am now on my fourth post, and I am so excited to share with you about the Borneo Reef World. 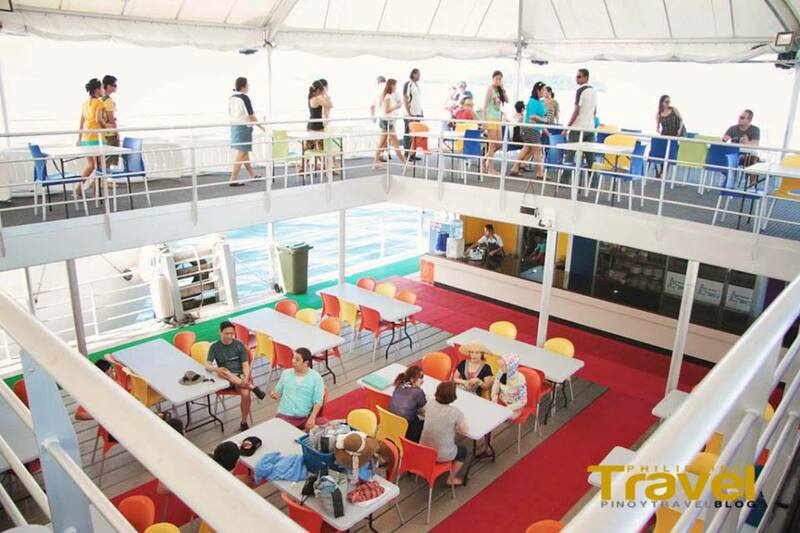 The Borneo Reef World in Kota Kinabalu is the biggest pontoon in South East Asia. What is a pontoon you ask? It is a floating structure, like a flatboat that is used to support a bridge. The pontoon has a dining hall, upper deck with sun beds (with the magnificent view of the sea), smoking area, changing rooms and well-maintained comfort room (my biggest concern! as always!). If you are new to sea activities, Borneo Reef World is a great place to start. The experience is as if you are cruising. There are 5 sea level platforms for different sea activities. Want to see the fish but don't want to get wet and don't know how to swim. What are the things you can do here? Click Read to know more..
Well, I just actually borrowed that from this guy - who did the briefing. He so much reminds me of my friend Vivek - his wit, accent and eloquence. Borneo Reef World is offering.. If you want to see the fish but don't want to get wet and don't know how to swim. The Borneo Reef World is a two-level pontoon with another level submerged in the sea where you can see marine life as they are. boom! it is like a war under the sea. I love snorkeling because it makes me see how exciting life is under the sea. I have seen how beautiful marine is in the Philippines and Indonesia, so I would not let the chance to see what Sabah is offering under the sea. What do we need? Snorkel gear and Life Jacket which are available in the Borneo Reef World. 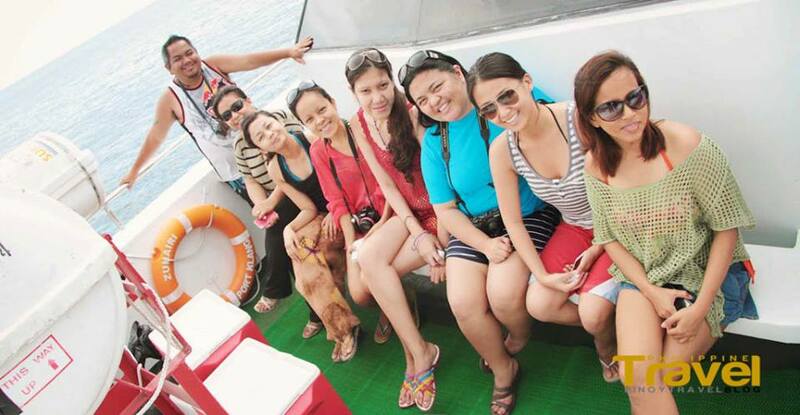 I love that their Life Jackets are secured (like the ones that they have in Dive7000 Batangas). It has secured fastens for your legs as well which prevents the life jacket from floating at your back when you are submerged in the sea. So we are ready? I said a little prayer and off I tested the water. I know for a fact that it is deep. During the briefing, we were told that if we drop something, there is no chance we would recover it. But I feel safe, thanks to life jacket. It would be Marjorie and Earth's first to try this kind of activity, and I am happy to be part of their milestone! Yey! Thank you John of kumagcow.com for taking these pictures! 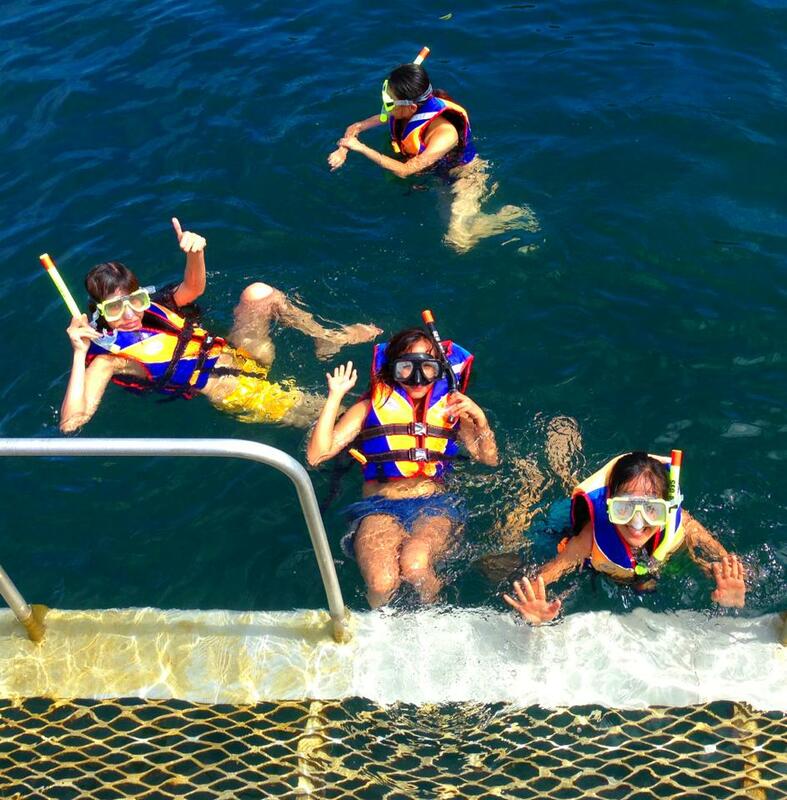 For first timers to do snorkel, it is a good starting point. I know there are more fishes and colors to see if we go beyond the line, but we were not allowed to, plus, I personally didn't know how to swim and going back to the pontoon might be a challenge. I am no mermaid. This would be an exciting new experience that everyone should try. 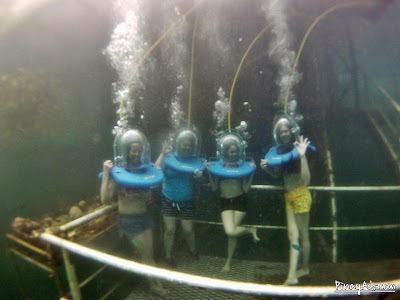 I have tried this in Boracay, but I wouldn't let the chance to experience what Borneo Reef World is in store for us. Yeah, that's how I travel, I try everything. Before we even put on the helmet and conquer what's under the sea, it is time for a quick briefing. We were taught the hand signals - ok, means you are okay, thumbs up means go up, sway your hand left to right, palms down means something is not right. Okay, so we are ready. I honestly don't know what hand signal I am doing here. I am saying, hold on, stop. The most common problem you will encounter is the painful ear, as if someone is dragging it down. The cause is because of the difference in the pressure from your ear inside to outside environment. The trick is to close your nose and mouth and blow air out to your ears. Thank you Ferdz of Ironwolf for taking this picture! I was a bit nervous, more nervous than my first time. Probably because now I know the risks of doing this unlike during my first that I just went down and enjoyed. 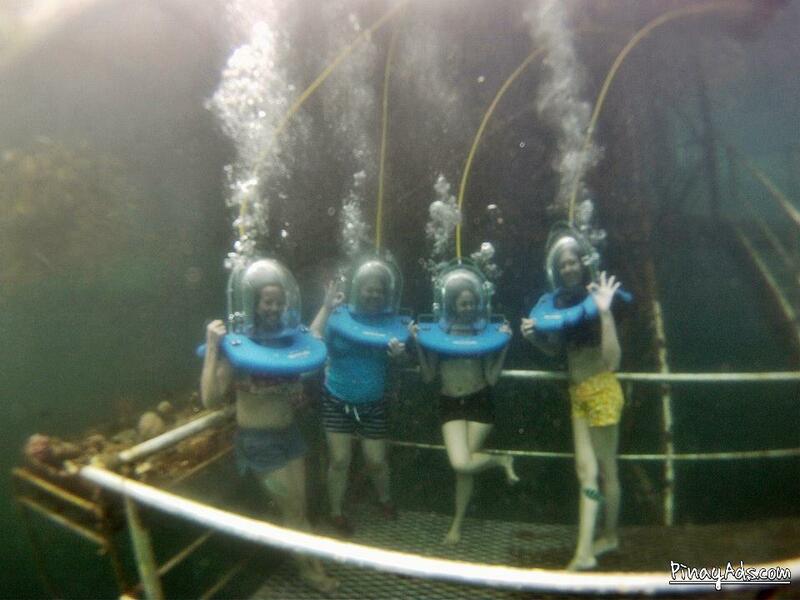 After sometime, I came to relax, as I saw my blogger friends enjoying their time under the sea like mermaids! Then I can signal, OKAY! 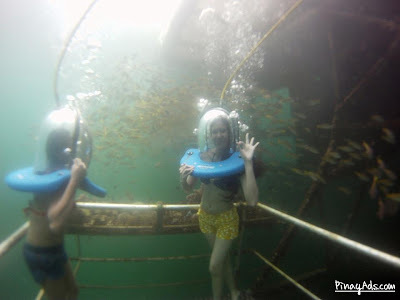 Unlike the previous helmet walk I experienced, in here, you will walk in the small platform and you will see coral set up on the side and fishes swimming with you. I have seen more colorful marine life than what they have in Borneo Reef World, probably because of the limited space, as the team is also concerned in preserving the marine life. They even noted that we can only dive on one side of the pontoon as the other side is busy with boat traffic. This is a good experience for a fee of RMB 150 with certificate for 20 minutes. Something worth posting in Instagram. If you want to see the fish, and get totally wet. I missed the chance of doing the dive again, but it was a bit risky since we cannot dive if we are flying the following day, as we needed to rest for more than 12 hours. Our flight was lunch time, but I decided not to take the dive anyway, I am hoping there would be another chance. It was a missed opportunity as Borneo Reef World has certified instructors (one is even from Europe who found the place so beautiful that he decided to stay). It would have been nice to actually experience going down and sharing the stories with you. But maybe, I will be back here soon. Who knows? 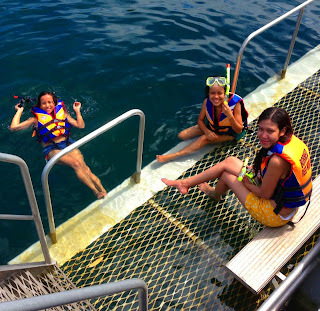 Aside from these four water activities, Borneo Reef World also offers parasailing, banana boat rides, kayaks, and helicopter transfers. Corresponding fees apply. There are other tourists on board during our stay - mostly from China and Korea. I love our stay in the Borneo Reef World, we got to relax, enjoy the beauty of nature, take so many pictures and just get to know other people we are with. What makes our stay more pleasant is the accommodating staff who ensure that we have everything that we needed and that we are enjoying our time. At lunch time, we are treated with a very good lunch menu - seafood, chicken and lots of veggies! Don't be deceived, this was just my first plate! Back to out hotel, we boarded the private speed boat together with the staff after the pontoon closes at 2:30 PM. We took the opportunity again to take many pictures! This awesome trip was made more fun because of the company of these awesome people! Next post would be our trip to the Mari Mari Cultural Village. Think be-heading and all the rituals! Stay tuned! 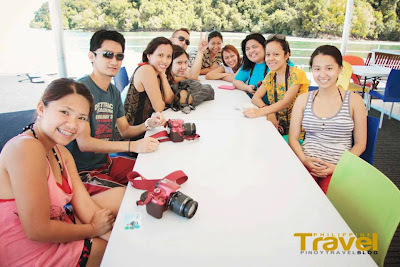 Photo Credits: Thank you to John Bueno of www.kumagcow.com, Iris Mejia of www.pinayads.com, Raffy Pedrajita of PinoyTravelBlog and Ferds Decena of http://www.ironwulf.net for taking beautiful pictures of our trip. Thank you once again to Zest Air, Sabah Tourism Board, Malaysia Tourism Board and Fleishman Hillard for flying us to Kota Kinabalu and letting us experience this awesome trip! ** Planning to go to Kota Kinabalu? Fly through Zest Air from Manila to Kota Kinabalu - flight schedule every Tuesday, Wednesday, Friday and Sunday - check out Zest Air and Air Asia sites. I might catch you on the same flight! Who knows, I might go back!